Do Asians Have Body Hair? 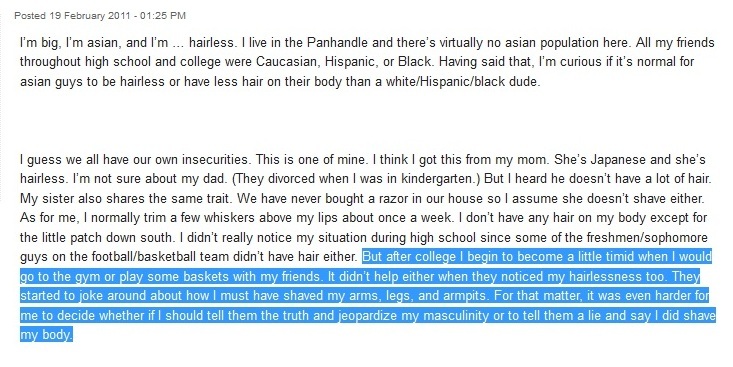 Growing up, the only time I ever felt insecure about being Asian American was when my non-Asian friends made fun of me for lacking body hair. At the time, I had no hair on my legs, chest, or forearms. They on the other hand had hair everywhere – including their backs! I desperately wanted body hair. I even considered shaving my legs to help facilitate hair growth there. I didn’t know this until I started “researching” this article, but body hair is one of the traits men often exaggerate in order to inflate their masculinity. This is known as hypermasculinity. It’s that last part that gets me because I’m pretty sure I felt the same way when I was this guys age. For all Asian kids out there, I want to find out the truth. Is there something to this stereotype? Do Asians really have less body hair than other races? People classified as Asians are physically different in some ways from people of European descent. In almost all cases Asians have straight, black hair and dark eyes. They also tend to have less body hair, less facial hair, flatter faces, smaller noses, wider cheekbones, and “shovel-shaped” incisor teeth (front teeth whose back side has a slightly scooped out shape). 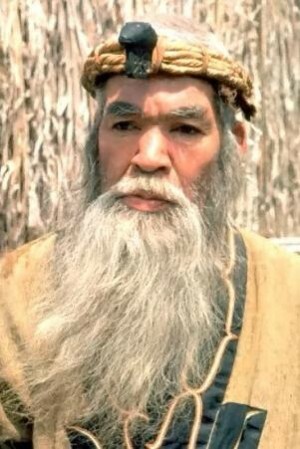 And according to this very questionable article, The Hairiest Cultures Around the World, the only category where Asians make the list are the Ainu, the indigenous peoples of Japan, which according to the article have the longest beards (but only because they don’t shave all their lives). And there is even a shirt proclaiming love for hairless Asian men! Not sure who in the world would buy such a shirt but the world is a little better place for me now that I know it exists. I’d like to end this article with a message to the bullies who tormented my hairless body. You guys were just jealous and insecure about your own hairy bodies. I see that now. I forgive you. But I hope you know that in a future life you will come back bald (if you aren’t already).